The only thing more confusing than how the #BLOTUS got into office is how he stays there. Is there no limit to the blind allegiance the GOP base will offer this family? Maybe he did actually tell the truth (once) when he bragged about being able to shoot down someone in broad daylight and still have the support of his base. 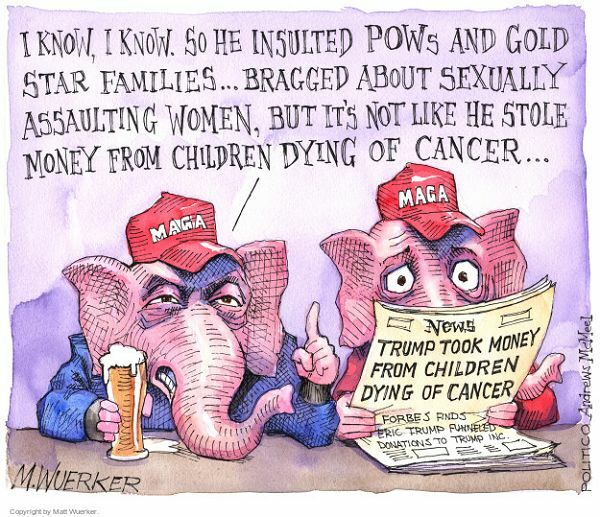 This entry was posted in News & Views, Quotes and tagged BLOTUS, bragging, cancer, cartoon, children, family, Gold Star Families, GOP base, insults, M. Wuerker, MAGA, make America great again, Politico, POWs, sexual assult, stealing, support, theft, Trump Foundation, truth on June 10, 2017 by Ray Buchanan.